(Nanowerk News) Pressure is a powerful thermodynamic variable that enables the structure, bonding and reactivity of matter to be altered. In materials science it has become an indispensable research tool in the quest for novel functional materials. Materials scientists can exploit the effectiveness of pressure for probing and tuning structural, mechanical, electronic, magnetic and vibrational properties of materials in situ; crystallography plays a crucial role, enabling on the one hand the unravelling of structural phenomena through a better understanding of interactions, and on the other shedding light on the correlation of structure and properties. With high pressure promoting effects such as magnetic crossover, spin transitions, negative linear compressibility, changes in proton conductivity, or even phase transitions that generate porous structures, high-pressure crystallographic studies on dense framework materials are on the rise. 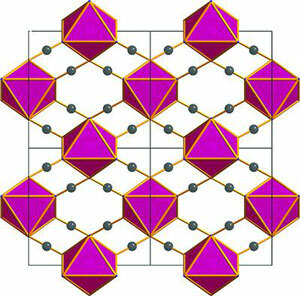 More generally, coordination compounds are a fascinating class of materials for high-pressure crystallographic studies, compared with purely organic compounds; they have an inherent extra degree of flexibility for responding to moderate applied pressures, as the geometry at the metal centre can undergo marked changes, whereas other primary bond distances and angles remain largely unaffected. A group of scientists (Acta Crystallographica, "Probing the structure of framework materials by high pressure and the example of a magnetic, non-porous coordination polymer") demonstrate that pressure offers a novel approach for generating new phases and exploring the structure-property relationships of molecular materials. In their study the researchers present a high-pressure crystallographic study of α-Co(dca)2, including the structural determination of the high-pressure phase γ-Co(dca)2. The pressure-dependence of the atomic structure was probed within a diamond-anvil cell using synchrotron-based powder diffraction methods. Future work from the group based at Argonne National Laboratory will involve investigations of the pressure-dependent structures of further transition metal dicyanamides, including members of the iso-structural α-MII(dca)2 family as well as other polymorphs, to uncover any universality or metal-ion dependence associated with the α-γ transition, and if other new phases can be generated.